Let me start this rather lengthy post by saying THANK YOU SO MUCH to all who have filled out the FOXY OXIE reader survey thus far. Although the giveaway is now over (congrats to Hayle Olson, who was the lucky winner of the "Luscious Lips" art print! ), you can still complete the quick, 10-question survey to help me craft content that you'll find useful and interesting! 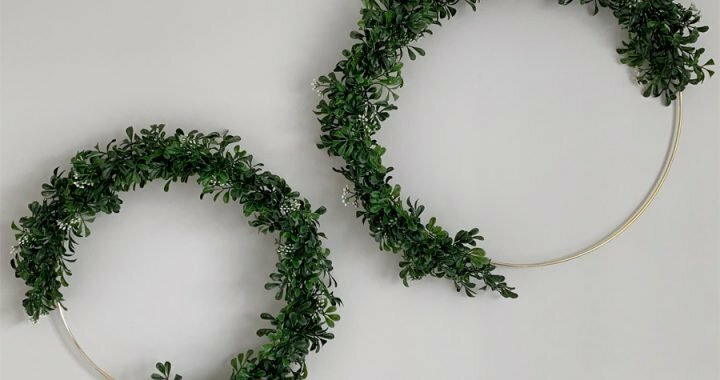 In the survey so many of you noted that you wanted to see lots more articles about home decor, as well as more updates on our bungalow renovation. This discovery makes me oh-so-happy, because, frankly, there has been little else on my brain for the past eight months. As a result, I have taken to planning out lots and lots of posts on the topic, so get excited, people! In all honesty, my perfectionist personality struggles with publishing raw, unpolished photos of the progress, but frankly, there's just no pretty way of portraying the mess, so my only other option is to not share at all, and what kind of friend would I be then?! I recently realized that I never shared our floor plan design and the many modifications we made to the previous layout of the house. 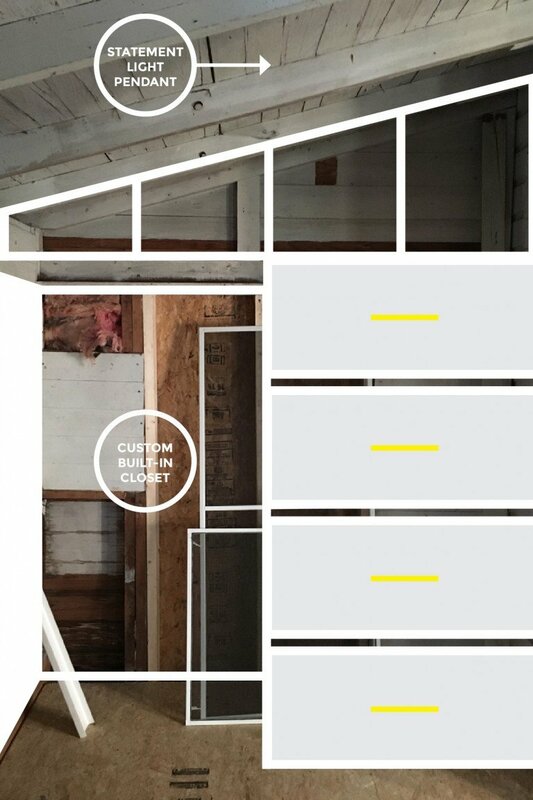 Here is a look at the new layout and how all of the rooms work together. As you can see, we've done quite a bit of work to create an open floor plan, which already has done wonders to this 1400 square foot space. 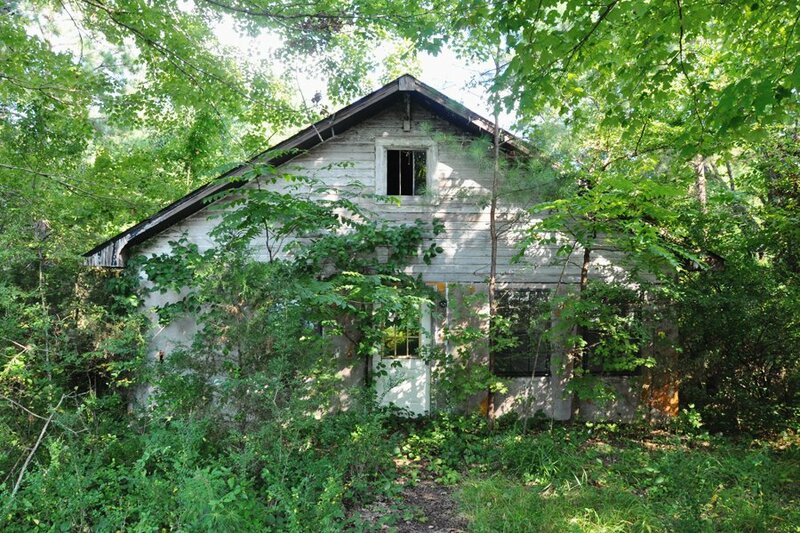 The front of the house was really quite enchanting – in a romantic, decaying sort of way. The poison ivy winding its way across the entire exterior and the barely visible remains of what once was a paved path to the front door added to the whimsical allure. Once some of the trees were cut down and the shrubbery cleared away, we could finally see what we had gotten ourselves into. To say that it wasn’t pretty would be a major understatement. 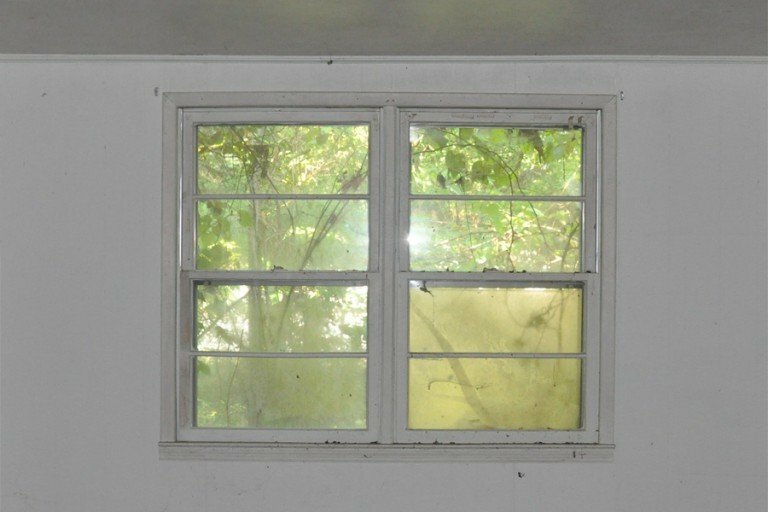 It sounds silly, but I remember feeling a bit heartbroken that the greenery had to go; if nothing else, it gave the house an almost magical look, as if it belonged in a fairytale. 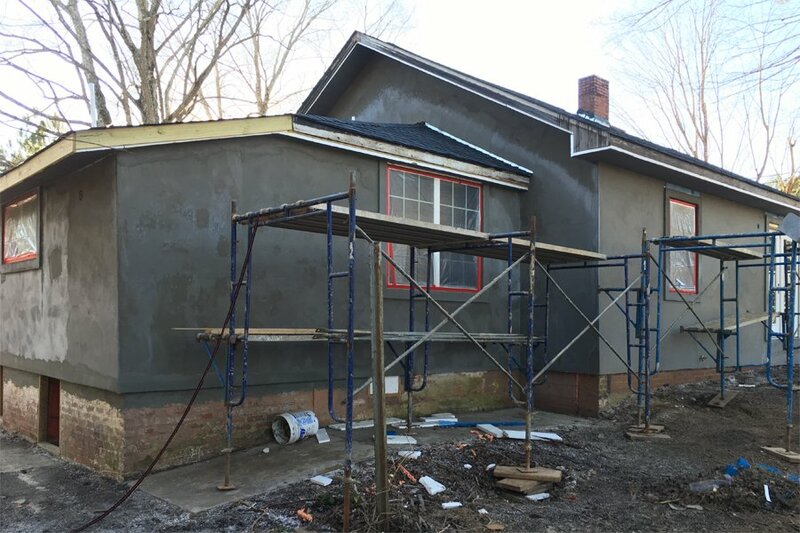 The photo above depicts the latest progress on the exterior, as we work to finish the stucco. The dark grey material is only the base coat. 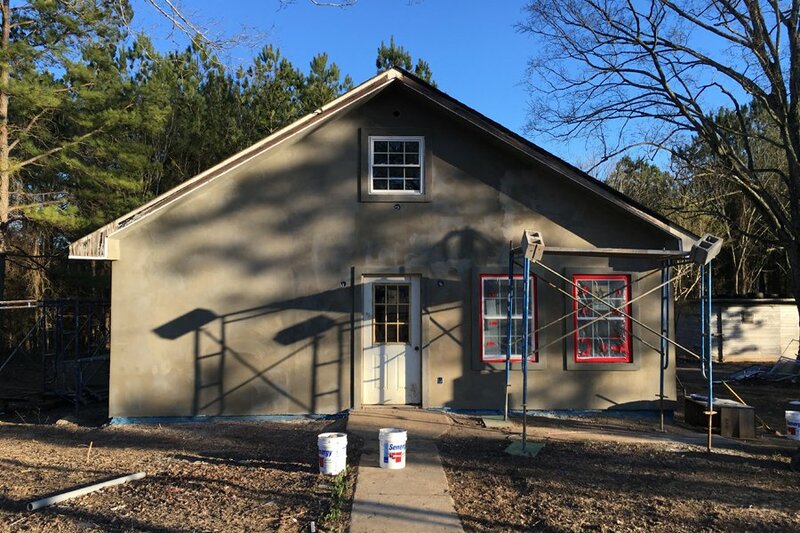 The actual stucco will be a light grey with a hint of blue – unless, of course, I change my mind at the last minute and decide to go with slate grey instead. I know you’re wondering about the unsymmetrical window placement. I must admit I too am having a bit of a difficult time dealing with the windowless wall on the left. 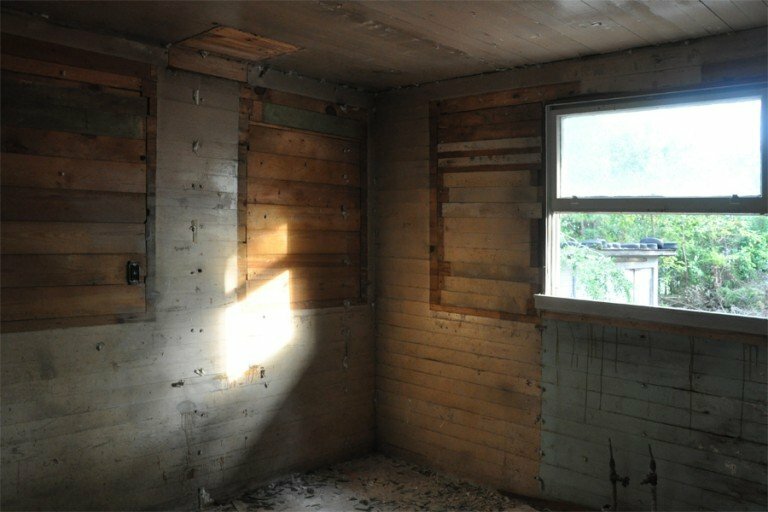 You see, the house came with a very unusual layout; it’s almost as if the previous owners kept adding random rooms and spaces that served absolutely no purpose, as you saw by the “BEFORE” house plans. 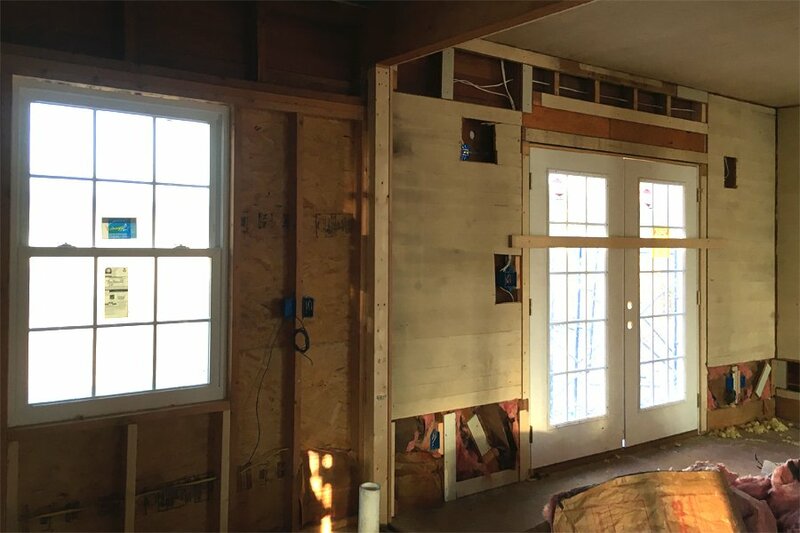 The entire front of the house was a sunroom of sorts that was never fully finished, so what we ended up doing is converting the entire left side into a kitchen. (It’ll make more sense once you see it on the inside.) 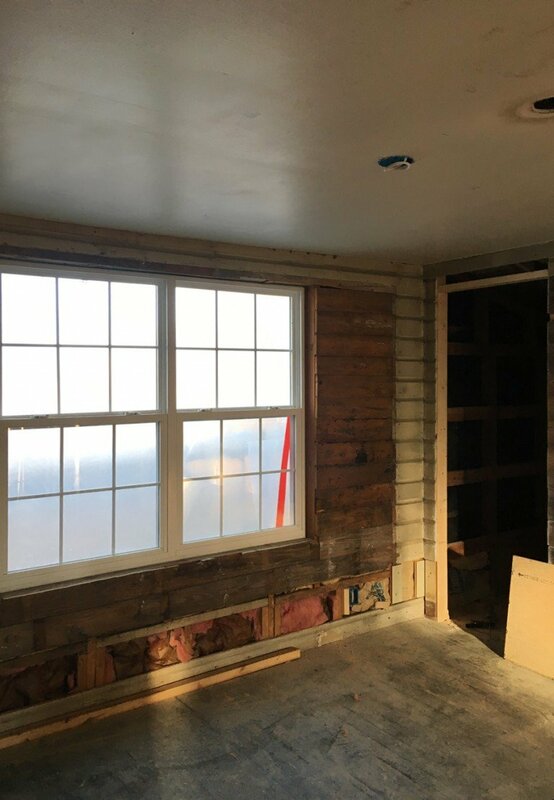 Because of this, we had to get rid of the lonely window on the left side to accommodate a wall lined with kitchen cabinets. 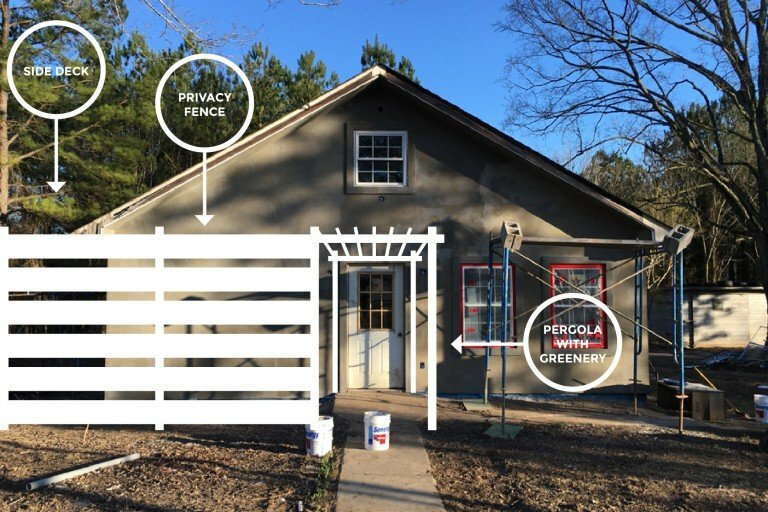 I’ve been collecting ideas on how to camouflage this part of the exterior, with the most probable of ideas being a pergola with a privacy fence connecting to a deck on the left side of the house. Check out my Houzz profile if you’d like to take a look at what I have in mind. If you have any suggestions on adding curb appeal, I am all ears! 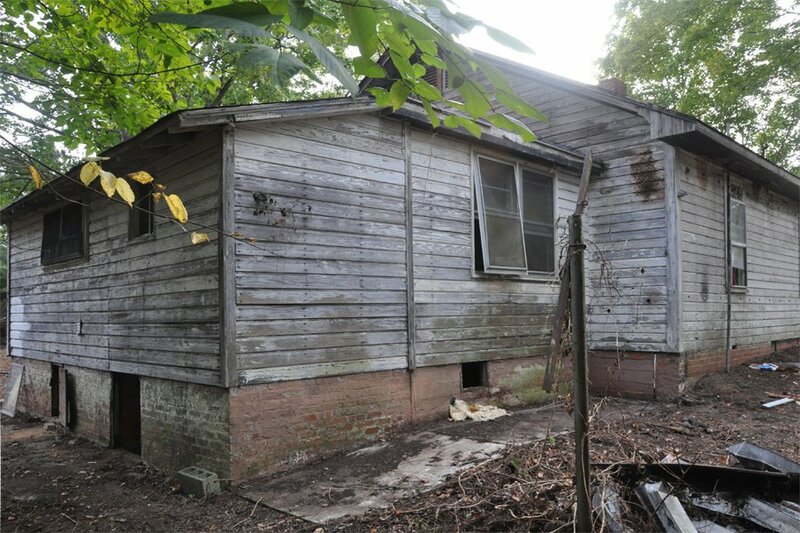 Here’s another “BEFORE” photo from the back corner of the house. Horrifying, isn’t it? It’s so validating to go back and remind yourself of how the place looked before and just how much progress we have made on it already! 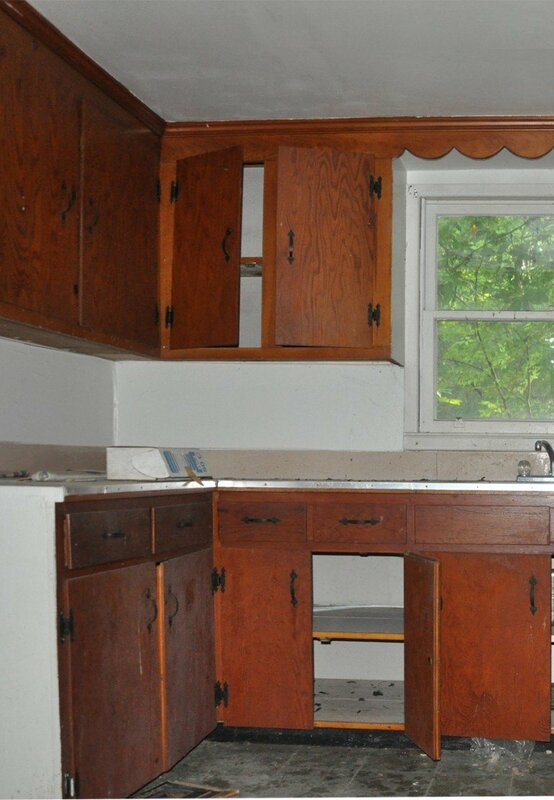 If it wasn’t for the “BEFORE” photos, I’d have a hard time believing it looked this terrible! But check out the transformation! Isn’t it amazing?! 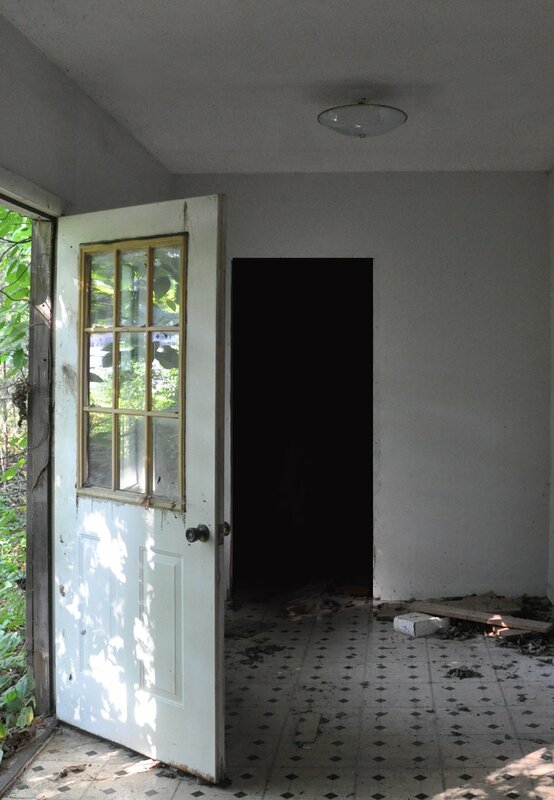 As I previously mentioned, to the left of the front door was a sunroom of sorts with a dark, windowless separated space filled with all sorts of oddities reminiscent of the past two decades during which the house stood abandoned. We knocked down the wall you see in the photo above and put up the wall you see in the photo below, immediately to the left of the front door to form what will be an L-shaped kitchen. 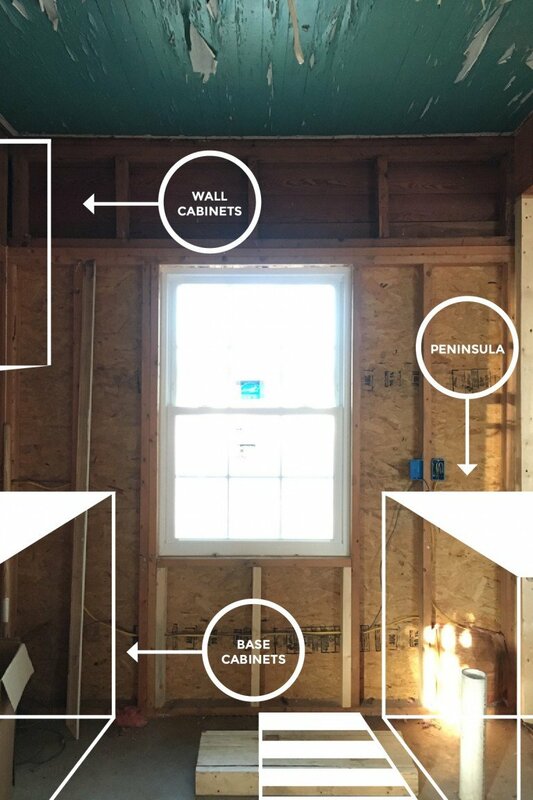 We added a window to let in natural light, since the entire left wall will be lined with kitchen cabinets. To the right of the window will stand the peninsula, beyond which will be the dining room, a space that was previously the master bedroom. As you saw in an earlier progress report, we replaced the window with gorgeous French doors that will open out to the side deck – perfect for al fresco dining. What was originally the kitchen has now become the master bathroom, with this particular corner being the master shower. Let’s switch gears for a minute and focus on the back of the house. What used to be the dining room has been transformed into an extra bedroom. 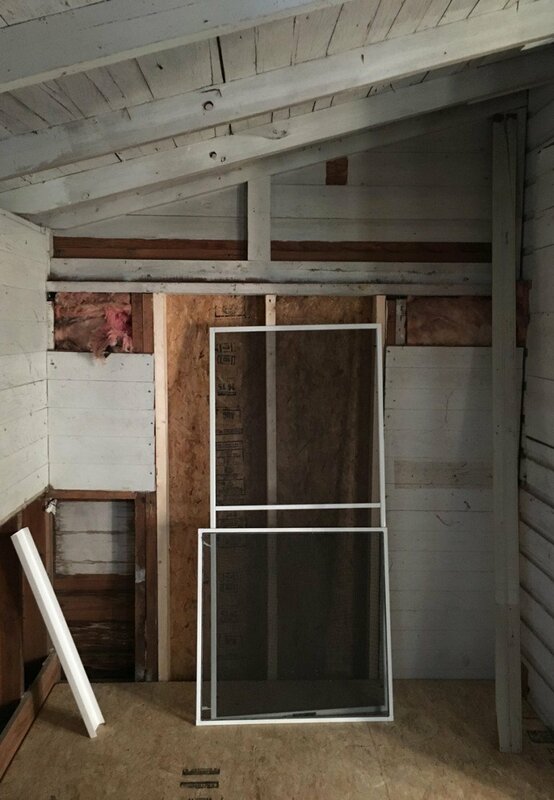 We added a door to the wall on the right and converted the storage room in the very back of the house into a walk-in closet for the extra bedroom. 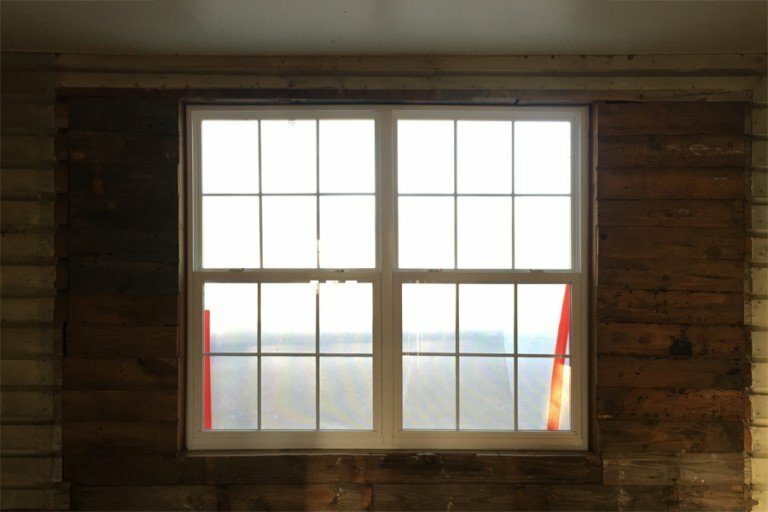 As you can see, we installed new windows in every room of the house, taking every opportunity to add more natural light where possible. I realize the “BEFORE” photo may look a bit more appealing than the progress photo below, but “It gets worse before it can get better,” as they say. I’m over here dreaming of the morning sunlight that will stream into this exceptionally large window. I originally planned to make this room the master bedroom, but because it was a later addition to the house, the ceilings aren’t as high as in the other rooms. 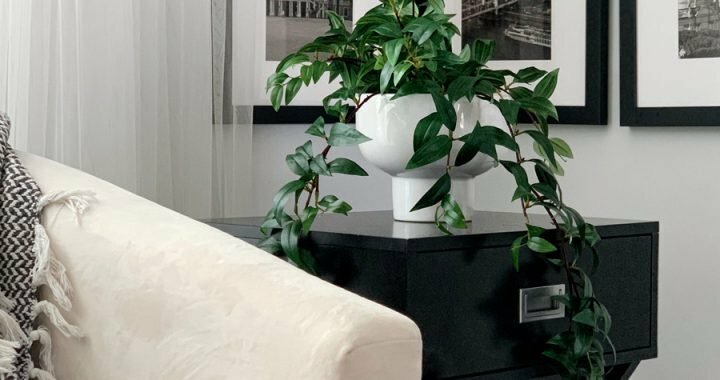 As much as I adored that room, keeping it as a guest bedroom instead of the master was much more budget-friendly than raising the ceiling – a modification that, quite possibly, would’ve used up our entire renovation budget. 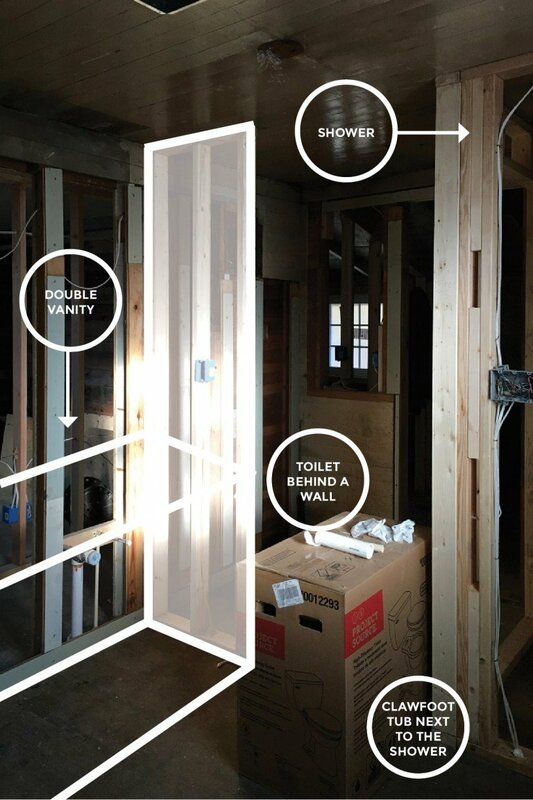 Moving on, you already got a glimpse of the master bath in yesterday’s post about my plans for our vintage clawfoot tub, but here’s a draft of the double vanities that’ll stand across the room from the tub, with the toilet being separated by a small wall. 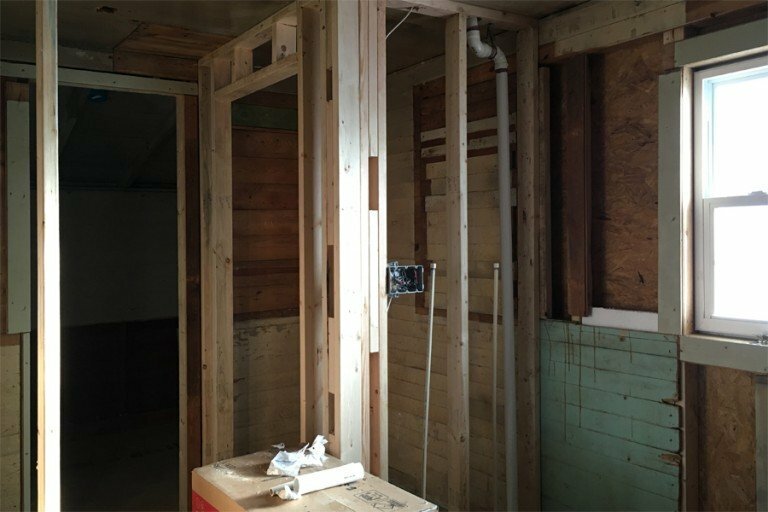 As you saw in the floor plan design, what was originally the kitchen is now the master bathroom, with the corner below now being the master shower. To make it a little more clear, another glimpse from a different angle of some of the earlier progress, after we took out the kitchen cabinets. We added a door on the wall to the wall on the left, which will lead to the master closet. 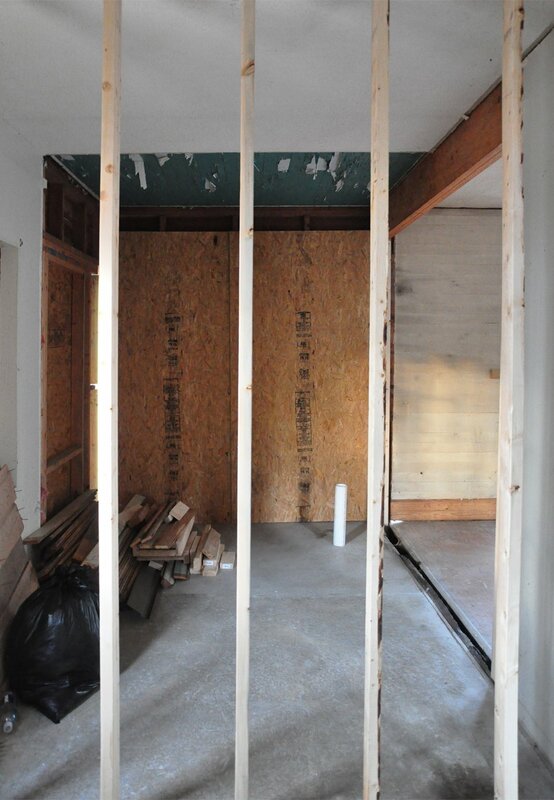 Speaking of the master closet, here is a “BEFORE” photo of the space that will serve as our walk-in master closet. 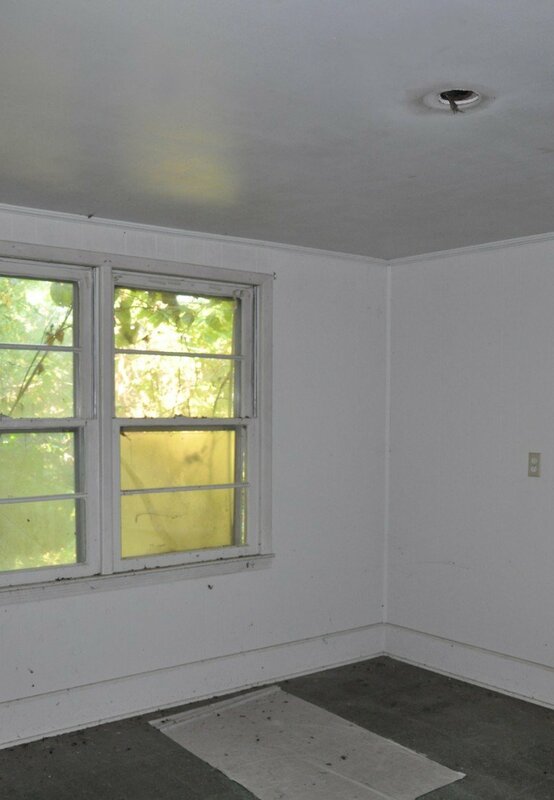 I believe the previous owners intended it as a mud room of sorts. 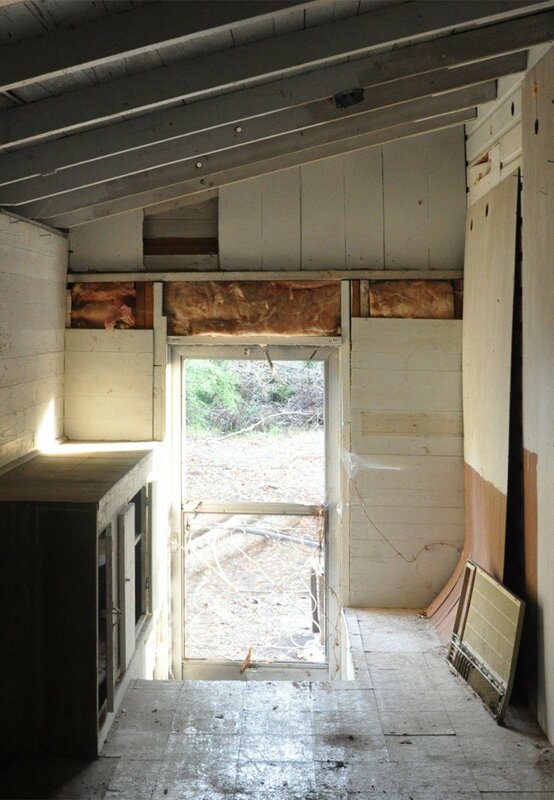 The outside door has since been closed up, and the floor leveled out. Directly to the right is the doorway leading to the master bathroom, which you saw earlier. And that, ladies and gentlemen, concludes our tour. 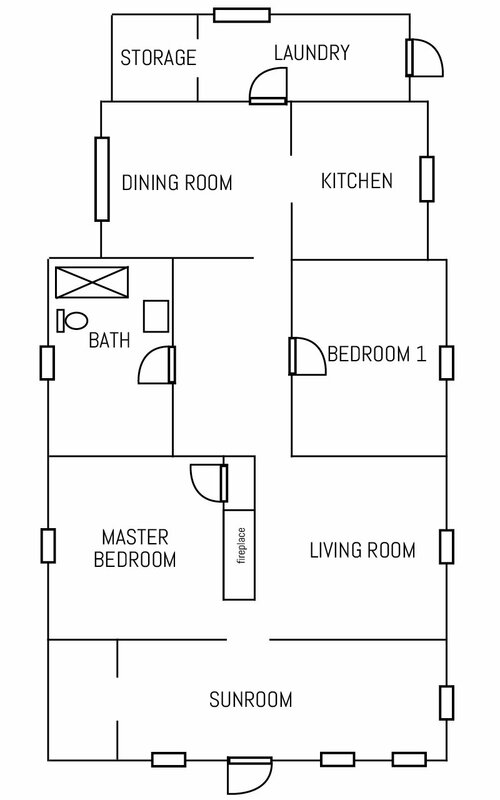 What do you think of the floor plan design and our progress? Posted in HOME DECOR, OUR BUNGALOW RENOVATION. I finally found the before post! I have been looking to see what it looked like at the start. You have made so much progress. 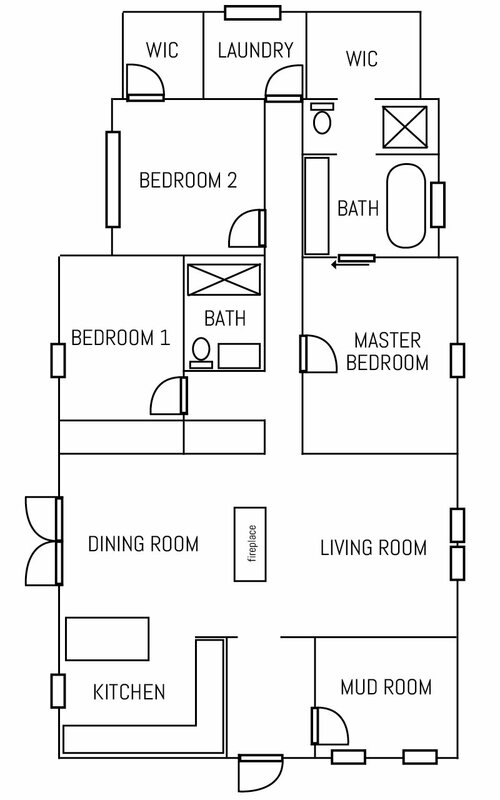 How do you make such great floorplans? Wow! 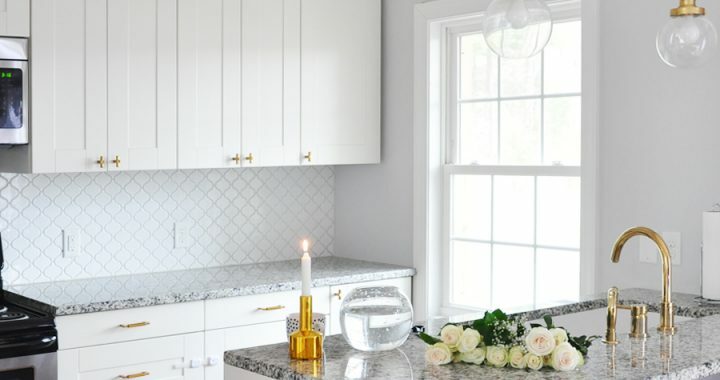 This is so fascinating, I am obsessed with home decor and renovations especially older homes. I just went back and read all of your other posts and now I am dying to see the progress to come! My goodness that is quite the renovation! I can’t imagine how much work it will be, but in the end I am sure it will be amazing. WOW! You guys are doing a complete renovation. Reminds me of the renovation shows I watch on TV LOL. I can’t wait to see how it turns out. This is awesome!! 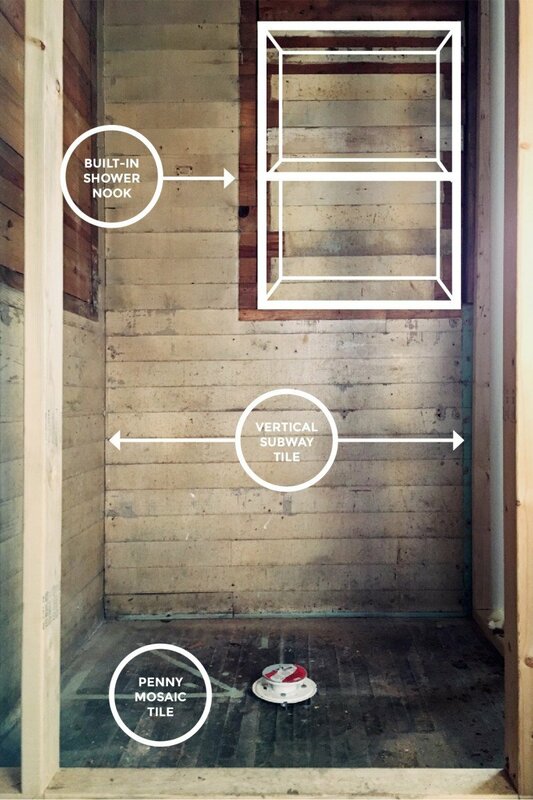 This just makes me so excited to start building my own house!! Holy cow, this progress is amazing! I have no idea how you are doing it – I would be soooo clueless. I;m loving these posts! What amazing progress! You have such a lovely, creative vision that I really admire. I always find it hard to imagine future layouts and design elements, but it looks like you have a clear view of what this is going to look like – and it’s going to look amazing! So cool. Can’t wait to see more! This is fabulous! You have certainly taken on a large project, but I can tell from your designs that it’s going to be fabulous! I love how you totally changed the floor plan, the new layout makes so much more sense! This is so exciting! Congratulations on such a great undertaking. I can’t wait to see more of your progress and definitely the finished product. Oh my gosh- you have done an incredible job! The progress from its start until now is crazy. Can’t wait to see the finished product. Wow, it’s going to look amazing once it’s fully done! Can’t wait to see the progress. 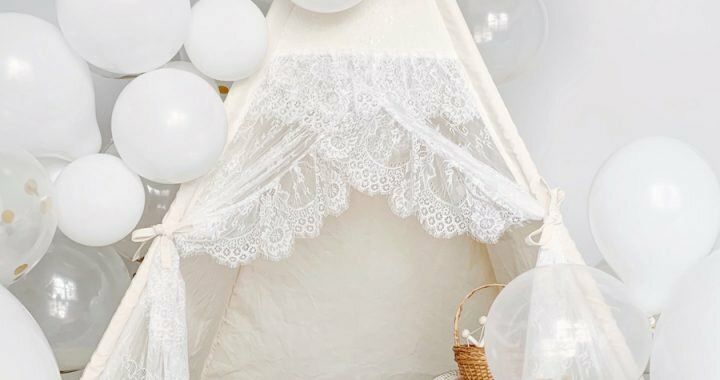 I love seeing projects like these come together! I can’t wait to see the end product! 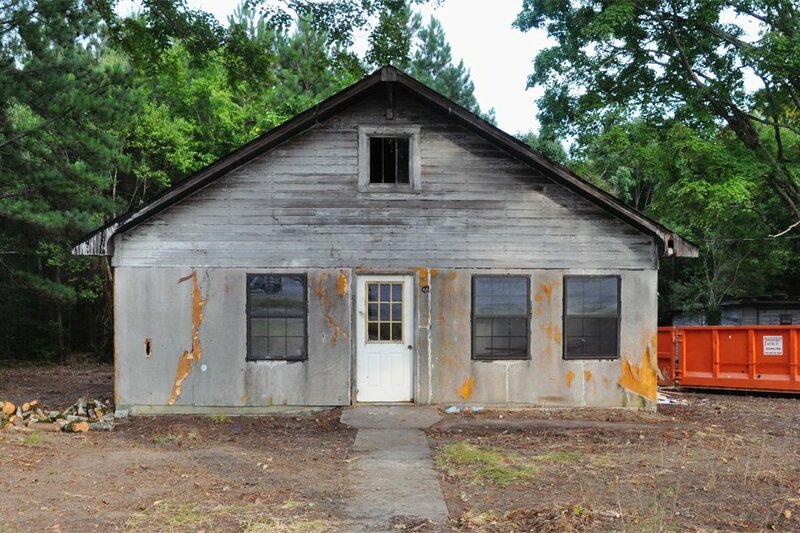 I cannot wait to see the fully transformed home. Everything looks great so far!